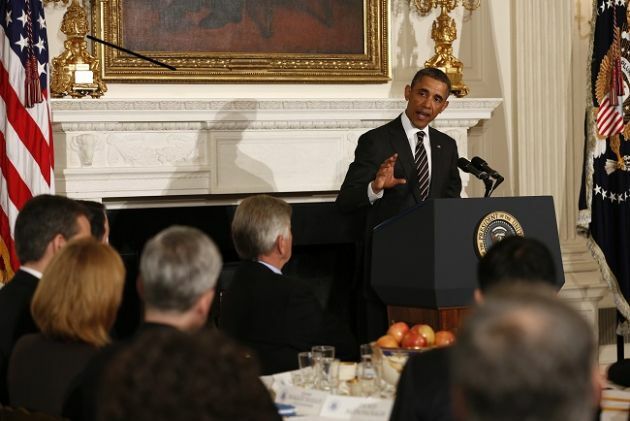 (Photo: Reuters / Kevin Lamarque)U.S. President Barack Obama speaks to the National Governors Association in the State Dining Room of the White House in Washington February 25, 2013. U.S. Christian leaders are calling on President Barack Obama and leaders of Congress to end the political "brinkmanship" that they say is slowing the nation's economy in an effort to protect programs that serve the poor and vulnerable from budget cuts. The U.S. federal government is set to make across-the-board "sequestration" cuts to its budget on Friday. The cuts would be $85 billion, or 2.4 percent of the nation's $3.5 trillion federal budget. The standoff between leaders of the Democratic and Republican parties is the latest in a series of fiscal showdowns over the past two years over the nation's budget. "Moving from one crisis to another has slowed economic recovery and has kept Congress from finding a sound, moral path to fiscal sustainability," the leaders wrote. "Other important issues go unaddressed, all the while increasing cynicism about our political process. Congress' actions should not provoke a serious economic setback or push more people into poverty." More than 100 Christian leaders from a broad spectrum of denominations and organizations issued a "Pastoral letter" on Monday to political leaders. The leaders have banded together over the past two years to advocate for "A Circle of Protection" around government programs for poor and hungry people. Nevertheless, they acknowledged that "we understand that the country's fiscal health will require further cost savings and additional revenue." "To reduce the deficit, we need revenue and savings that don't increase poverty," they wrote. They said the nation's long-term health care costs are "major drivers of the nation's long-term fiscal challenge, and adjustments will be needed over time." They said that cuts to government health programs low income seniors and other low income people can be made to avoid harm. Some proposals for reducing cuts have called for cutting benefits or eligibility. The leaders noted that previous deficit reduction measures over the past two years had not included large cuts for programs focused on hungry and poor people.